Wisconsin's recently announced Elizabethkingia outbreak (see last week's Wisconsin DOH & CDC Investigating Outbreak of Elizabethkingia Bacterial Infections) continues to expand with four more cases announced this week. 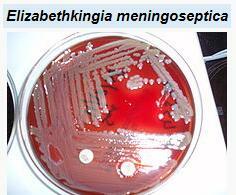 Ubiquitous in nature, and often multi-drug resistant, Elizabethkingia is a gram negative aerobic bacillus that only rarely causes opportunistic infections in (generally immunocompromised) humans. A state the size of Wisconsin might only expect to see 1 or 2 cases a year. And yet despite this rarity, Wisconsin has reported 48 cases since November, spread across 11 counties in the southeastern and southern part of the state. The Wisconsin Department of Health Services (DHS), Division of Public Health (DPH) is currently investigating an outbreak of bloodstream infections caused by Elizabethkingia. The majority of patients acquiring this infection are over the age of 65, and all patients have a history of at least one underlying serious illness. At this time, the source of these infections is unknown and the Department is working diligently to contain this outbreak. The Department has alerted health care providers, infection preventionists and laboratories statewide and provided information as well as treatment guidance for this outbreak. After that initial guidance was sent, there has been a rapid identification of cases and healthcare providers have been able to treat and improve outcomes for patients. Affected counties include Columbia, Dane, Dodge, Fond du Lac, Jefferson, Milwaukee, Ozaukee, Racine, Sauk, Sheboygan, Washington and Waukesha.